LOS ANGELES, CA — West L.A. Music is very excited to congratulate customer Noah Scot Snyder on his recent GRAMMY win. 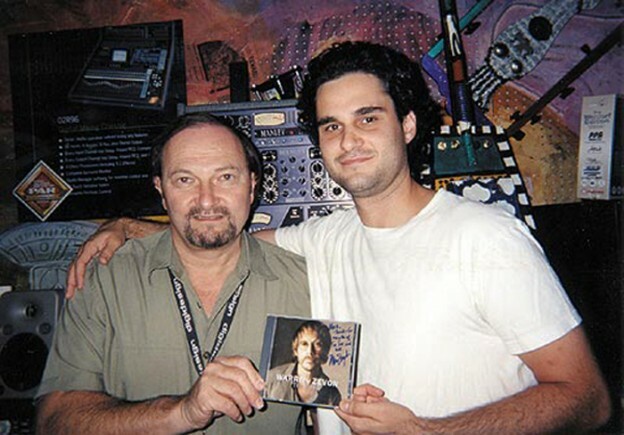 Snyder was a producer, engineer and mixer on Warren Zevon’s last album “The Wind” which received the GRAMMY for Best Contemporary Folk Album. One of the album’s songs, “Disorder In The House” by Zevon and Bruce Springsteen, also won a GRAMMY for Best Rock Performance By A Duo Or Group With Vocal. A loyal store customer Snyder said, “Of course I shop at West L.A. Music, because Mark Spiwak takes great care of me! He makes it a no-brainer.” West L.A. Music’s Recording Department Manager Mark Spiwak actually brought Snyder and Zevon together. Zevon had been a long time West L.A. Music customer when he asked Spiwak for recommendations on engineers. Snyder and Zevon were introduced and first worked together on Zevon’s 2002 album “My Ride’s Here”. The two continued to join forces on Zevon’s farewell album which received five GRAMMY nominations and two awards. Snyder’s credits also include recording scores for the movies “Fifty First Dates”, “The Hulk”, “Terminator 3” and “Chicago”. Most recently Snyder has mixed the music for two soon to be released movies, a Miramax feature called “Carolina” and a CBS TV movie of “Romy & Michelle’s High School Reunion”. For over 30 years, West L.A. Music has supplied music, audio and recording equipment to top artists around the world. The first music retailer to implement a “beat any deal” policy, industry insiders count on West L.A. Music’s personalized knowledgeable service and comprehensive selection of professional products from leading manufacturers. West L.A. Music supplies equipment for recording studios, broadcast companies, film and video post production facilities, major artists, producers, composers, and record companies, as well as schools, churches and government agencies. West L.A. Music offers expert system design, installation, and training services for outfitting home studios, sophisticated world class studios, local clubs, concert arenas, and more. This entry was posted in Press | Life on February 5, 2014 by shintech99.